Hooray for you! You made it through the hustle and bustle of summer, and beautiful autumn is just around the corner. The trees will soon be aflame with leaves turning a palette of vibrant colors. Fall is definitely the season to rethink your skin tones and hair colors. The first tip for fall is to become radiant all over, all over again. Repair the damage that summer did to your hair and skin by visiting our experienced doctors and nurses at Beauty MD. According to Eveline Charles, founder and CEO of the EvelineCharles Salons | Spas | Beauty MD | Academy in Calgary and Edmonton, “Summer wreaks havoc on our hair and skin, even our hands and feet. Now is an excellent time to rejuvenate yourself from head to toe.” Beauty MD Treatments that will help heal and renew your skin include Photo Facials, Skin Resurfacing, Microdermabrasion, SkinTyte, and Chemical Peels! It makes you feel happy on the inside when your hair and skin look healthy and feel great. Remember, feeling attractive on the inside and comfortable in your skin is what truly makes you attractive. Fall time is definitely our favourite fashion and beauty season. With thicker materials coming back and deeper makeup and hair tones, autumn 2018 is all about daring comfort! Here are some fall fashion predictions. To begin with, if it ain’t bold, it’s old. The leaves are turning their magnificent, dark, autumn colors, and so should you. Whether you sport a pony, a bun or let it all hang loose with a blowout, ‘tis the season to be fabulously dark brown! There will be a veritable rainbow of colors, beginning with rainbow bangs, which are especially attractive with black hair. Another color that’s trending for black hair is “Ronze,” a blend of red, copper and bronze. Eggplant is also going to be a big winner for dark hair; it will give bland, dull hair a revamped shine and tone. Several colors for blonde hair are trending. Dip-dyed pink makes an elegant and dramatic statement on blonde hair. Want to make a bigger statement? Orange is going to be the new fluorescent purple and replace cotton candy pink. For blondes who want to take a step toward brunette, take a look at the color “Bronde.” It’s going to be all the rage come the fall. You heard it here first, the eyes get the blues! This fall, blue is going to be the eye makeup color of choice. Don’t be afraid to add a strong liner and even some glitter. Bold – especially in Blue – is beautiful. The smoky-eyed look is making a strong comeback along with silver eye shadows and metallic liners. 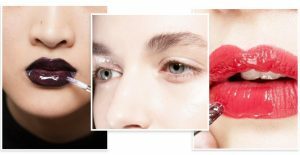 For the more adventurous, intense neon colors, brow bleaching and the classic Twiggy lashes are all going to be seen this fall. Go ahead, pout! Pouting lips are back in vogue for autumn. But, don’t be shy about it. Dark lips, set off with dark colored liners are what the pout is all about. If you want even more pizzazz, add some gloss, or return to those bright neon lips of the eighties. Interested in a Fall Makeover? Receive $20 Off when you book a cut and colour at one of our 4 salons. Go ahead and give us a call today!